LEED (Leadership in Energy and Environmental Design) is a globally recognized sustainability achievement symbol. It is the most widely used green building rating system and is available for all types of building projects from new construction to interior fit-outs. 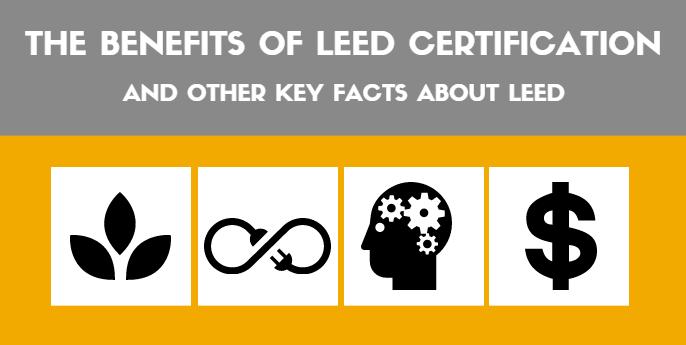 LEED provides parameters for creating efficient, healthy buildings with cost-saving methods. How does a project earn LEED Certification? There are different levels of LEED: Certified, Silver, Gold and Platinum. Projects pursing LEED certification must first demonstrate compliance with all mandatory prerequisites. They must then earn a certain level of points, based on areas of that address sustainability issues, to achieve a certain level of LEED. Yes. Rates are calculated based on the date of project registration. There is an upfront flat rate registration fee. Certification fees are based on your project’s rating system and size. For more specifics on fees, click here. There are probably as many answers to this question as there are LEED buildings. Officially, LEED buildings are healthier for occupants and for the environment. They are designed to be resource-efficient and cost-effective buildings and intended to enhance the lives and experiences of those who walk through the doors. Unofficially, LEED certification is a great marketing tool. A building with LEED certification, at any level, shows a vested interest from ownership. It shows that the building is updated (if not brand new) in order to run efficiently and help save tenant’s utility costs. LEED certification is difficult to achieve so having the certification shows that thought, care and capital were put into the building and its effect on the environment and its occupants. That is attractive to potential tenants or buyers. Theoretically, there is no downside to LEED. Building a well-designed, sustainable and efficient building is a good thing, no matter what. The criticism of LEED is that it addresses how a building is designed and how it is intended to be used. However, as building is built and is occupied, is it really being used per the design intent? Often times, LEED buildings do not run nearly as efficiently as they were designed to once they are occupied.